The rugged power supply market is witnessing significant advancements due to the rapidly-changing technologies in the power industry. Power supply markets around the world are experiencing a major change with rapid rise in adoption of next generation power supply such as renewable energy and micro grids. The military sector demands highly reliable power supply systems since military operations need better durability, reliability, and ruggedness. The global market for rugged power supply is forecast to quickly grow to US$ 26,084.3 Mn by 2026 with a staggering growth rate of 5.5%. Rugged power supply is being widely adopted in the military sector due to its beneficial features such as the ability to perform seamlessly in a variety of intense climates and harsh terrains. Also, it is capable of ensuring long cycles of use with minimal maintenance. Telecommunications industry also requires robust and rugged power supplies that can be installed in telecommunication towers. These towers have their own set of challenges with demanding environments starting from dusty and dirty locations to the extent of submersible power applications. Growing need to protect sensitive data from grid power instability & downtime issues and smooth running of the telecommunication network is driving the global rugged power supply market. Over the past few years, there has been a significant adoption of commercial off- the- shelf (COTS) technology which is favoring adoption of rugged power supply. The rugged power supply service market has been segmented on the basis of type, components, system type, end-use, and geography. Based on type, the market has been segmented into programmable and non-programmable types. In 2017, programmable segment accounted for maximum market share. This is because a programmable power supply system is capable of supporting more than the single or dual power outputs. The voltage and current of a programmable power supply is capable of being adjusted over a wide range. It can also have multiple outputs to power multiple circuits across the system. In terms of components, the market has been classified into hardware and software. The hardware segment is further sub-categorized into DC/AC convertor, AC/DC convertor, DC/DC convertor, EMI filters, and others (Inductors, Transformers, etc.). In 2017, the AC/DC convertor segment accounted for nearly half of the total market share followed by DC/AC convertor. This is mainly due to strong revenue growth in power supplies for military communication devices and electronic components. There are several applications of AC-DC power supplies in the military sector including computers, televisions, cell phone chargers, alarms, and other electronic consumer devices. They are also used in military equipment that use DC motors. By system type, the market is divided into discrete power supply system and integrated power modules. The integrated power supply segment is further sub-divided into synchronous and non-synchronous type. In 2017, the total share of rugged power supply for integrated power modules out of the total revenue was greater than half of the market. During the forecast period, significant increase in adoption rate of integrated power is predicted since it offers better reliability and power density compared to discrete power supply system. Based on industry, the market is bifurcated into telecommunications, medical & healthcare, military & aerospace, transportation, lighting, food & beverage, and others. In 2017, the military & aerospace segment accounted for maximum market share, while the telecommunication segment is predicted to expand at a healthy CAGR during the forecast period. This is mainly due to demand for next generation rugged power supplies for cell towers, communication equipment, networking, conferencing, SATCOM, storage, telecom equipment, and telecom machines applications. In terms of geography, the global rugged power supply market has been classified into North America, Europe, Asia Pacific, Middle East & Africa, and South America. North America is anticipated to hold a significant share of the market over the forecast period followed by Europe and Asia Pacific. The United States holds approximately 45% of the global defense budget and has the strongest military power at present. The presence of advanced military power supply technology as well as early adoption of COTS software in the U.S, has made North America a global leader in the global rugged power supply market. Further, the market in Asia Pacific region is predicted to be among the fastest growing due to ongoing technological innovations, expanding at a significant CAGR. The market in Middle East & Africa is forecasted to witness a moderate growth rate due to presence of world leading military forces in GCC countries. South America is expected to showcase sluggish growth in the rugged power supply market as compared to other regions. 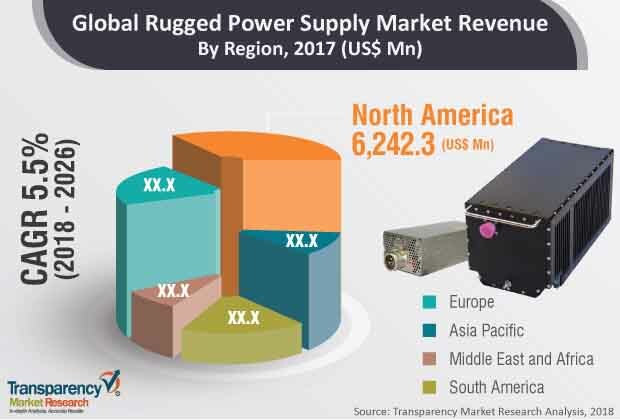 The global rugged power supply market is dominated by players such as XP Power, Advanced Conversion Technology, Eaton Corporation, Aegis Power System, Inc., TDK-Lambda Americas, Inc., Abbott Technologies, AGMA Power Systems Ltd., Energy Technologies Inc., Synqor, Inc., AJ’s Power Source Inc., Prime Power Inc., Powerbox International AB, Milpower Source, Astrodyne TDI Power Supplies & EMI Filters, Artesyn, Behlman Electronics, Inc., Cosel, Dawn VME Products, Delta Electronics, Extreme Engineering Solutions, Inc., General Electric Ltd., Mean Well, Murata Power Solutions, Rantec Power Systems Inc., Siemens AG, VPT, Inc. and Mitsubishi Electric Corporation. This comprehensive report by Transparency Market Research analyzes and forecasts the rugged power supply market at the global and regional level. The report provides analysis over the period 2016–2026, wherein 2018 to 2026 is the forecast period and the base year is 2017. An in-depth and unbiased market assessment has been made to offer readers in-depth and accurate analysis. The report emphasizes on all the major trends and services playing a key role in the growth of the rugged power supply market during 2018 - 2026. It also focuses on market drivers, restraining factors, and opportunities of the rugged power supply market during the said period. The study provides a complete perspective about the rugged power supply market throughout the research study in terms of value (in US$ Mn) across various geographies, including Asia Pacific, South America, North America, Middle East & Africa (MEA), and Europe. The report includes a detailed value chain analysis, which is focused on providing an extensive view of the global rugged power supply market. The market’s Porter’s Five Forces analysis is also provided to understand the competitive scenario in the market. The study incorporates a market attractiveness analysis, wherein the market segments, for instance, power supply types, rugged power supply components, system type, and significant end-use segments are benchmarked based on their market size, growth rate, and attractiveness in terms of opportunity. Supply demand analysis of commercial off- the- shelf (COTS) power supplies vs. modified or custom power supply has been explained in the report. In order to give a complete analysis of the overall competitive scenario in the rugged power supply market, every geographic region mentioned in the report is provided with attractiveness analysis. A market overview chapter in the rugged power supply market report explains the market trends and dynamics which includes the market drivers, restraining factors, and opportunities for the current and future rugged power supply market. A market outlook analysis has also been provided globally in the report. Additionally, the report provides analysis of different business strategies being adopted by market leaders of the rugged power supply market. Market introduction chapter assists in gaining an idea of different trends and services related to rugged power supply along with their types and applications. The study provides a decisive view on the global rugged power supply market, by segmenting the market on the basis of type into programmable and non-programmable system; by component into hardware and software. Hardware segment is further bifurcated into DC/AC convertor, AC/DC convertor, DC/DC convertor, EMI filters, and others. Classification on the basis of system type includes discrete power supply system and integrated power modules (synchronous & non synchronous). By industry, the market has been classified into telecommunications, medical & healthcare, military & aerospace, transportation, lighting, food & beverage, and others. The report provides a detailed breakdown of the rugged power supply market region-wise and categorizes it at various levels, thus providing valuable insights at micro and macro levels. The report highlights the competitive scenario within the rugged power supply market, thus ranking all the major players according to key recent developments and their geographic presence. The insights for the rugged power supply market are the result of our extensive primary interviews, secondary research, and in-house expert panel reviews. These market estimates have been analyzed by considering the impact of different economic, political, social, legal, and technological factors. On the basis of country, North America market is bifurcated into Canada, The U.S., and Rest of North America. Furthermore, the Europe market is analyzed across France, Germany, U.K., Italy and Rest of Europe. The APAC rugged power supply market is also segmented at country level which includes China, Japan, India, South Korea, and Rest of Asia Pacific. Middle East & Africa region covers the GCC, South Africa, and Rest of Middle East & Africa. Similarly, South America region includes Brazil and Rest of South America. This report provides all the strategic information required to understand the rugged power supply market along with its components and end-users. Also, the report provides insights related to the components and different end-users according to the various geographical regions mentioned above. The research methodology is a perfect combination of primary research, secondary research and expert panel reviews. Secondary sources such asannual reports, company websites, SEC filings and investor presentations, national government documents, internal and external proprietary databases, statistical databases, relevant patent and regulatory databases, market reports, government publications, statistical databases, World Bank database, and industry white papers are usuallyreferred. Further, for this report we have specifically focused on data from the global defense budget, military spending on power supply, and developments in power supply, among others. Primary research involves telephonic interviews, e-mail interactions, and face-to-face interviews for detailed and unbiased reviews on the rugged power supply market,across geographies. Primary interviews are usually conducted on an ongoing basis with industry expertsand participants in order to get latest market insights and validate the existing data and analysis. Primary interviews offer new and fresh information on important factors such as market trends, market size, competitive landscape, growth trends, etc. These factors help to validate and strengthen secondary research findings. Moreover, the data collected and analyzed from secondary and primary research is again discussed and examined by our expert panel. The research study includes profiles of leading companies operating in the global rugged power supply market. Market players have been profiled in terms of attributes such as company overview, financial overview, business strategies, and recent developments. Parameters such as rugged power supply investment & spending and developments by the major players of the market are tracked. Some of the key players in the rugged power supply market are XP Power, Advanced Conversion Technology, Eaton Corporation, Aegis Power System, Inc., TDK-Lambda Americas, Inc., Abbott Technologies, AGMA Power Systems Ltd., Energy Technologies Inc., Synqor, Inc., AJ’s Power Source Inc., Prime Power Inc., Powerbox International AB, Milpower Source, Astrodyne TDI Power Supplies & EMI Filters, Artesyn, Behlman Electronics, Inc., Cosel, Dawn VME Products, Delta Electronics, Extreme Engineering Solutions, Inc., General Electric Ltd., Mean Well, Murata Power Solutions, Rantec Power Systems Inc., Siemens AG, VPT, Inc.and Mitsubishi Electric Corporation.